The maximum technical expression of Zlin Aviation is finally ready to make itself known. After 13 long months of preparation, planning difficulties, calculations and tests, and after much fascinating work, the unveiling of Zlin Aviation’s new airplane has finally arrived. The word “Cub”, first of all, aims to express the typical DNA of our production, which is a fundamental aspect to us and to our Clients. 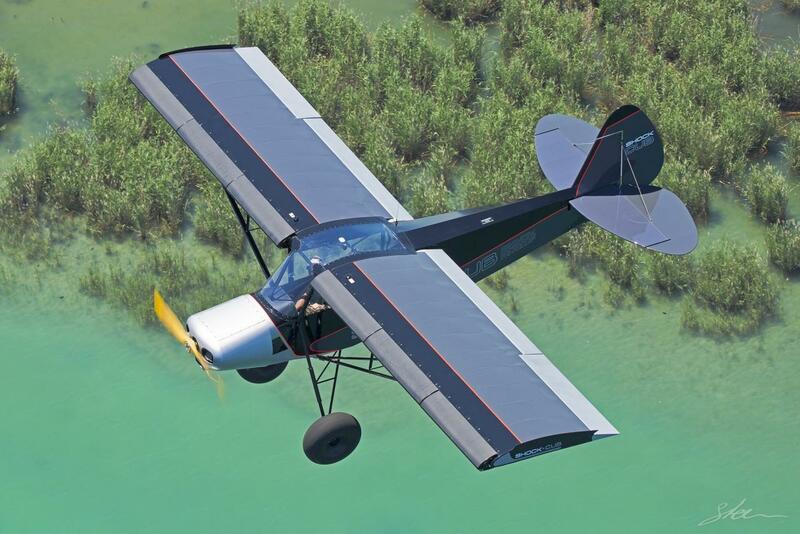 In fact, having the “Savage Cub” (the best-selling of our airplanes since its presentation), and its technical and stylistic natural offspring - the “Savage Cub-S”, presented 4 years ago already currently in production, we could do none other than to aim to emphasize this proven winning formula , while innovating it with originality and new technical features. 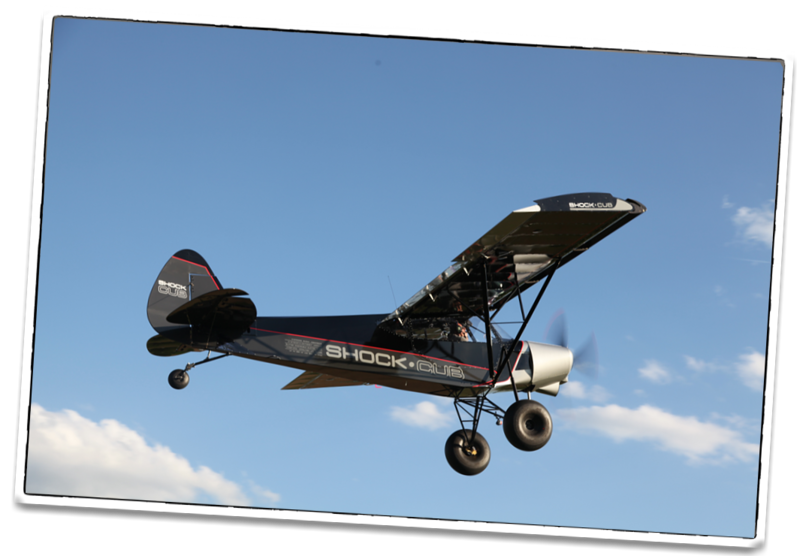 The word “Shock”, on the other hand, was added with strong conviction, and it aims to underline some important facts relating to the entire project – to pleasantly “shock”, with features unattainable in other planes, during one of the most important operative phases of an airplane, the final approach and touchdown, through “Shock Absorbers” specifically designed and terribly efficient. 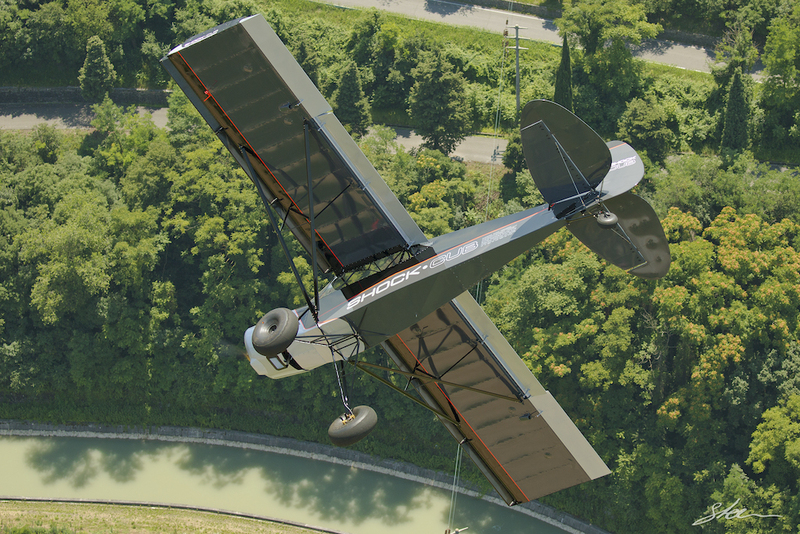 After having constructed, sold and delivered around the world over the last 18 years hundreds of Savage aircraft, each one with its own specific personality, esthetic and performance range, it would seem unlikely that Zlin Aviation could manage to offer a new chapter to this varied and fascinating family of aircraft. 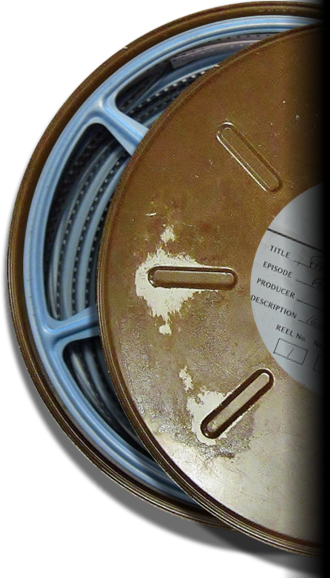 To reinvent oneself continually, to innovate, to fascinate and to formulate new, exciting performance features has always been important to our small but fierce and determined “skunk works” team. Anyone who has met us in person can certainly attest to, among other things, the presence of one great denominator and catalyst of “stream of consciousness”…. 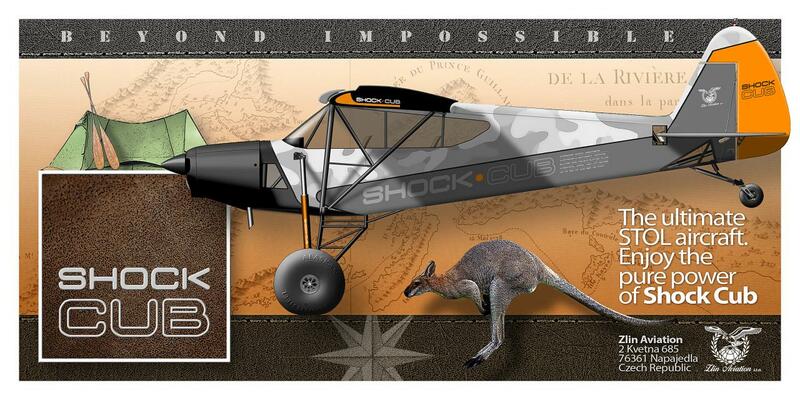 : a passion for true “Bushflying”. To continually study, to use the acquired knowledge from nearly 20 years of experience since the first flight test, to listen to our precious clientele, to re-imagine continually, ever avoiding the presumption to have reached the top (“Imagination is more important than knowledge”, said Albert Einstein), focusing our attention on all that Bushflying (understood as a way of being and living flight) offers and at the same time requires, enables us to proudly present today that which without a shadow of doubt is our maximum technical expression to date. What Bushflying is and what it represents, true, serious Bushflying, which permits thousands of pilots in Alaska to live, to work and to fly, professionally or recreationally, with maximum safety in unlimited nature which is rare in beauty but dangerous as well, is easily enough stated. 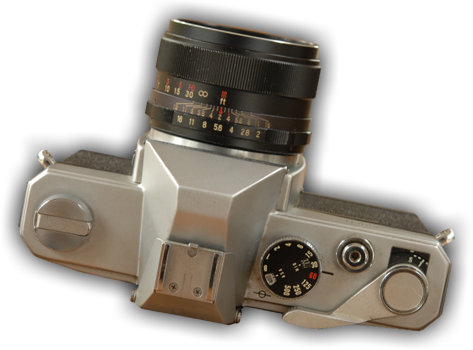 It is in the first place, in our “Vision”, an art. 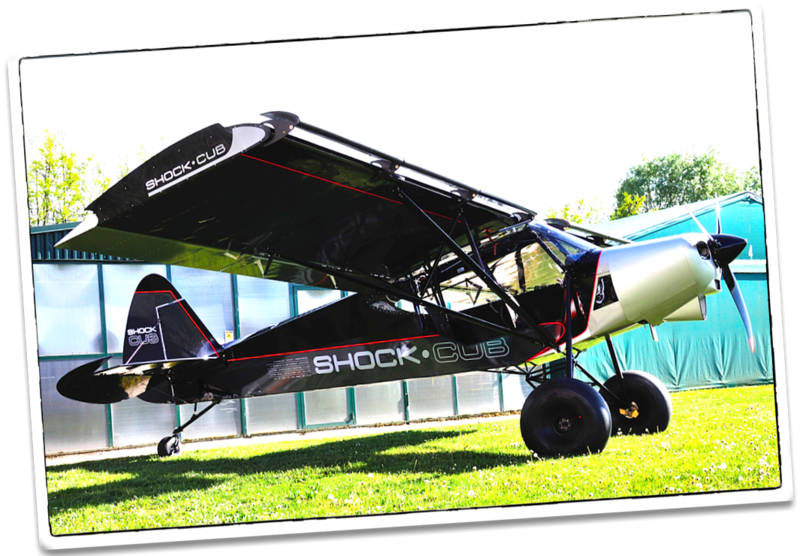 Our manufacturing company is situated in Europe, in an area which has much less of a tradition of this type of flight. 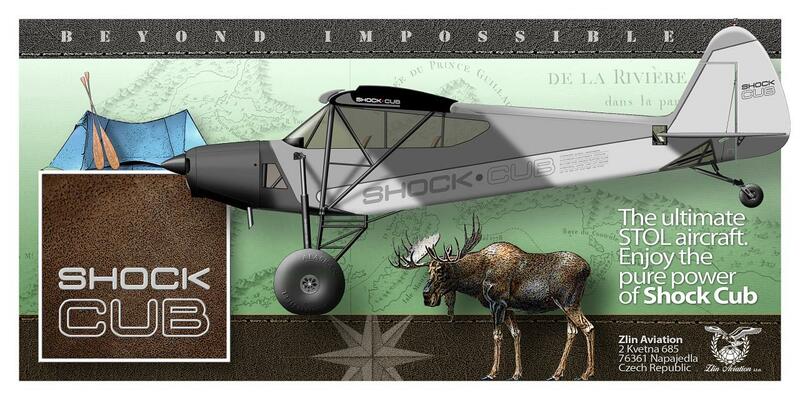 But imagine a flight in a remote area, rich in fjords like Norway, or among the enchanting Swiss Alps or Italian Dolomites, or even over the endless and rugged Russian tundra, and you will understand how this art cannot be limited exclusively to any specific place. To be able to land “anywhere”, by choice or for necessity (for example due to a technical problem), in ridiculously small spaces, with maximum safety, at very low speeds, with a landing system that enables you to overcome almost any obstacle, in a manner which is almost unknown among LSA’s and Ultra-lights currently present on the market, cannot be underestimated or reduced to a number of technical aspects. We are speaking of flying and operating on any territory with an effectiveness never before seen, in contact with nature, for any reason, whenever desired, and practically without limits, leaving the pilot free to follow and express even his most primordial instinct, with the greatest safety possible and with great versatility. 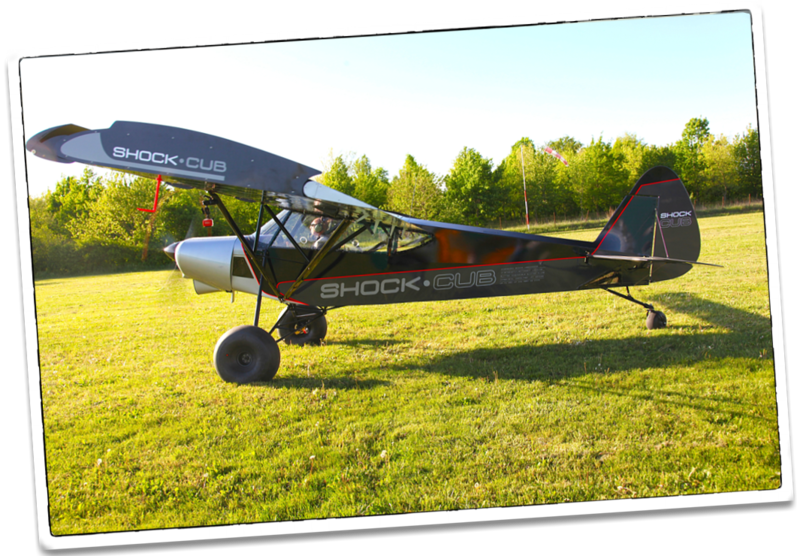 We believe that a performance similar to the Shock Cub can be found only in a helicopter. So for us, for our Vision, this style of flying is also “Art”. Flying art, but art nonetheless. The maximum velocity is not any longer the priority therefore, that the “minimum” velocity can become. In Alaska in fact, you will never find pilots of the Piper Super Cub (the aircraft that alone represents at least 90% of the two-seater planes in use in bushflying) who are interested in the maximum velocity, but you will always only find pilots interested in the minimum velocity and in the take-off and landing distances. And it is from those magic numbers, from this hidden pleasure that only slow flight offers and from these technical necessities, that actual competitions in short take-off and landing have emerged (over all “Valdez” in Alaska), which are avidly followed. 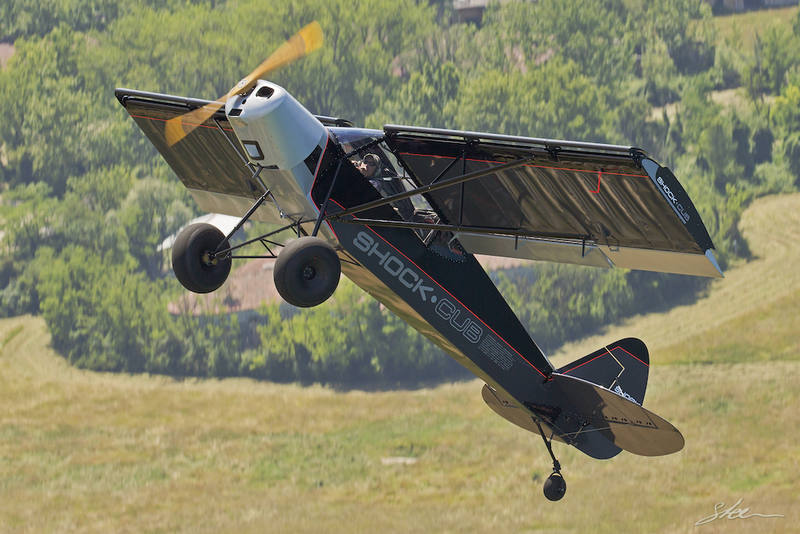 The specialized press tries its best to describe the take-off and landing distances of the performances and maneuvers in these competitions with words like “ridiculous”. We at Zlin Aviation believe we belong to this category of pilots and airplanes, for which and for whom the maximum velocity figure is simply a number, whereas the minimum and approach velocities become a true “added value”. But art isn’t enough. Poetry is not enough. 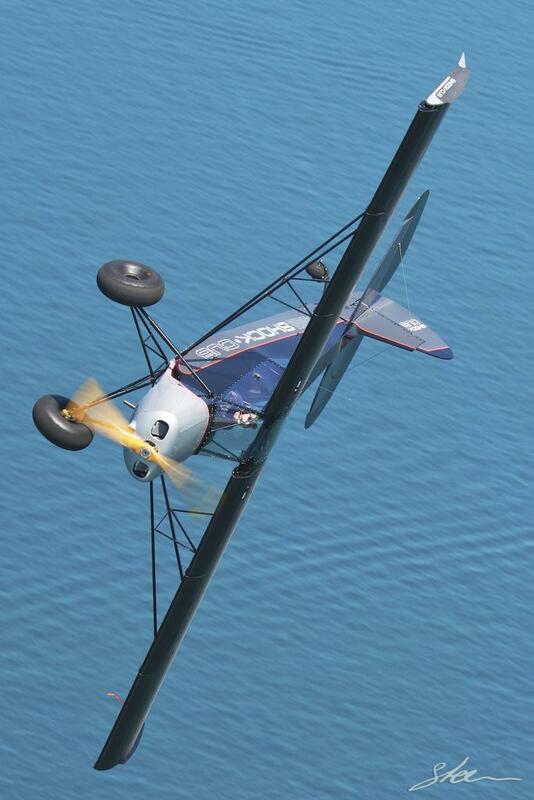 The philosophy which surrounds this type of flight isn’t enough. Bushflying is a serious thing, very technical and if you’ve ever talked to someone who does it for a living, you will have realized what’s truly necessary and what isn’t, in order to have and to give the utmost, in absolute safety. The framework first of all. 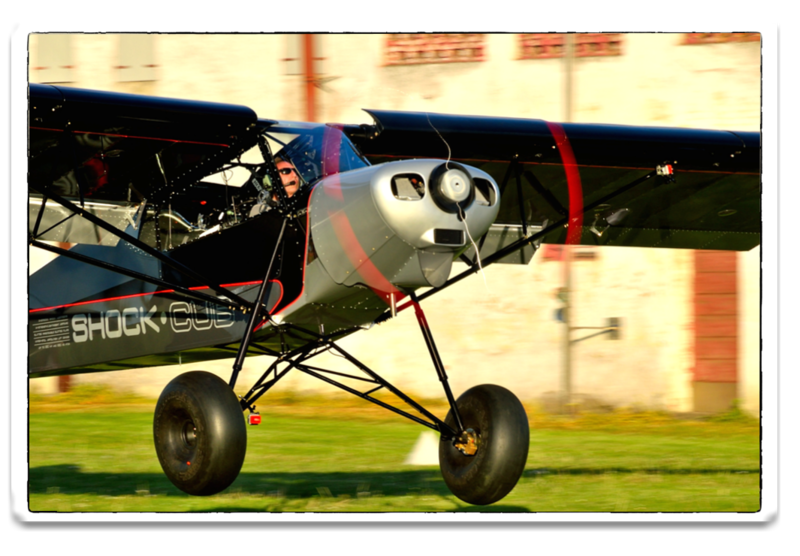 Try asking yourself why more than 90% of the two-seater aircrafts in Alaska are made exclusively with tubes and fabric, “taildragger” configuration and tandem seats, the typical type of decades-old construction. 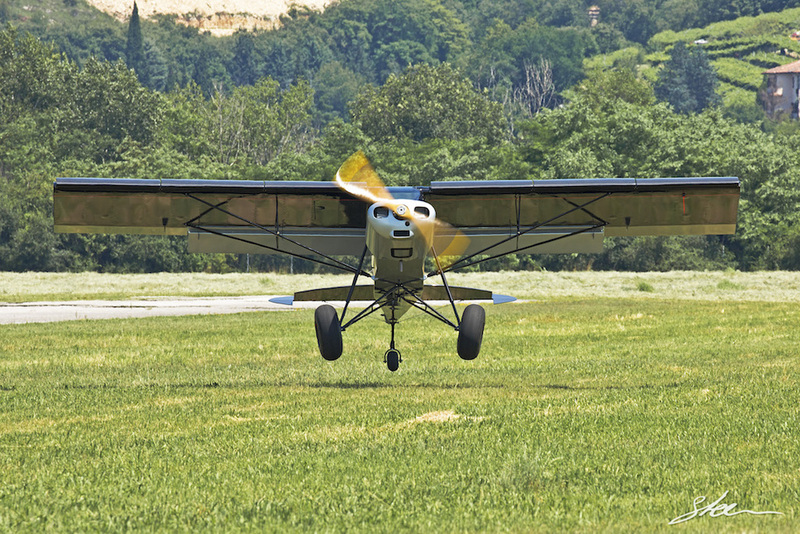 When someone asks why Zlin Aviation still produces this kind of aircraft in 2016 (when the greatest number of aircraft produced in today’s market aim at maximum velocity, Carbonfiber, and ever further streamlined and exasperated shapes), he should just try to imagine having to land in extreme situations with airplanes that are not taildraggers, without the fundamental Bush tires and are constructed in aluminum, or worse, composites, incapable therefore to absorb even light impacts (certainly not much heavier ones) from obstacles on the ground, and so are practically irreparable by the pilot in case of damages to the outer covering, not at all a remote possibility, when flying “in the middle of nowhere”. Imagine then that all this happens during a landing 500-600 kilometers from the nearest city where you are alone with your airplane, isolated from the rest of the world and you’ll understand why 90% of the pilots in Alaska, Africa and other remote regions operating two-seater aircraft in the bush, use only and exclusively this type of arrangement. These pilots know what is truly necessary and they don’t want to hear about other formulas, for a simple reason: the magic formula already exists and it has shown itself to be the winning one for decades. And every error or experiment in other directions could be very risky. 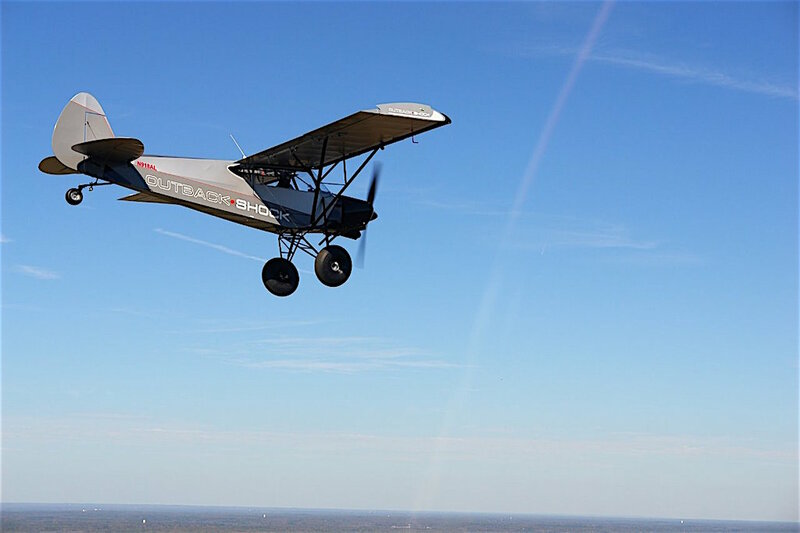 So, certainly this type of flying has its poetic and artistic undertones, but the technical and structural aspects must never be neglected, if we truly want to practice this wonderful type of flight. 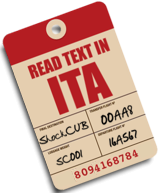 Our long experience in this sector and the continuous evolution in materials, in aerodynamics and in the formulas and techniques of super slow approach flying, have enabled us then, to construct that which represents for us the maximum expression of the concepts of bushflying, applied to the LSA and ultra-light market, in an attempt also to offer to pilots in other nations that which represents the height of the technology reached in this sector today. 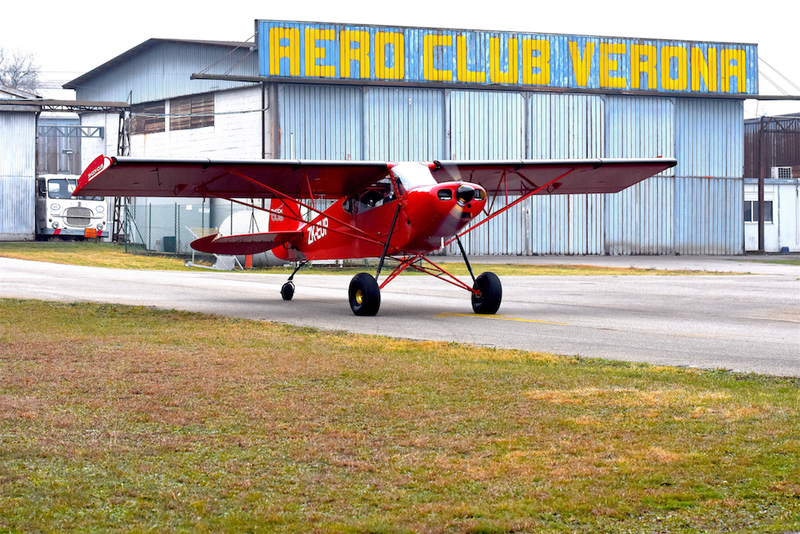 Since the beginning we proceeded from the optimal Savage Cub-S, reinforcing and refining the Fuselage Framework, increasing by several centimeters the cockpit height, improving the accessibility and the general ergonomics on board, which now is more advantageous. We have increased the surface of the already generous Cub-S Elevator and Rudder, fundamental elements in the “ultraslow” flight. 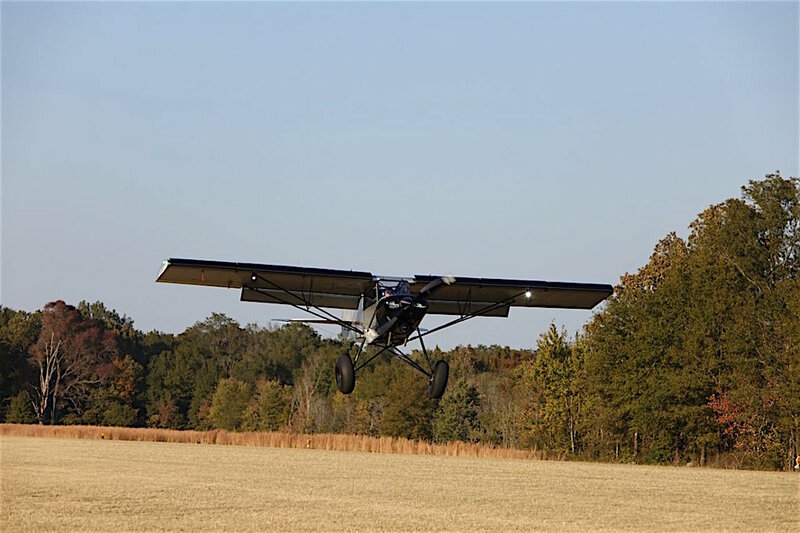 The Stabilizer vertical travel, due to the new Jack Screw Trim System, has been increased to balance the new Hyper Stol Wing angle of incidence. Finally a series of optionals aimed to a weight reduction up to 25 kg are available since now for our new Airplane as for all the other Savage. Since today, on request, the Cockpit can be decorated with Carbonfiber datails, such as, Instrument Panel, the new Floorboards, the Kevlar reinforced light weight Seats. New Throttle levers are installed in the baseline. 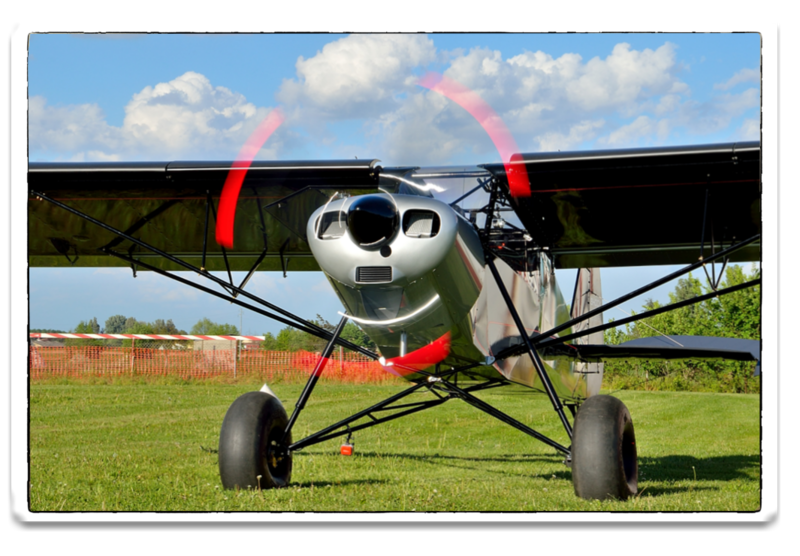 The basic Engine Mount for the Rotax is a dynafocal type and the Engine Cowling can accommodate up to 180 hp engines such as Lycoming / Titan or other make, on request. The Landing Gear is totally new, already reinforced in the basic series and is equipped with ultra-performing Shock Absorbers in three points. The Front and Rear Suspensions innovative Design shows an unimaginable shock absorbing capability and the Drop Tests have shown that with a weight of 1000 kg and an height of 120 centimeters the structure keeps its full integrity. Landing on a bumpy surface it will never be, since today, easier. The Landing gear position has been generously moved forward to allow an exceptional breaking capability without the risk of overturning. The weight increase due to this improvement versus the Cub S is very small ( 4 kg about). The Wing is totally new and, obviously, is one of the most important feature of this new Airplane. The new Wing is equipped with new customized Hyper Stol profile. The new Spars, together with many other structural improvements, have allowed us to test the wing up to above 700 Kg MTOW x 6g (Ultimate Load) with no residual permanent deformations. The attachments to the Fuselage have been radically revised and structurally improved. 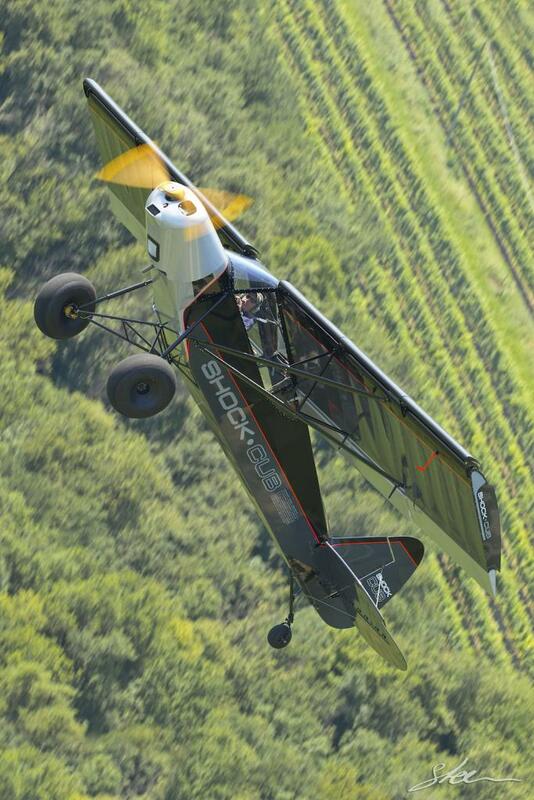 The wing tip is shaped for the best contribution to Lift in its area and, on request, is available also in Carbonfiber. 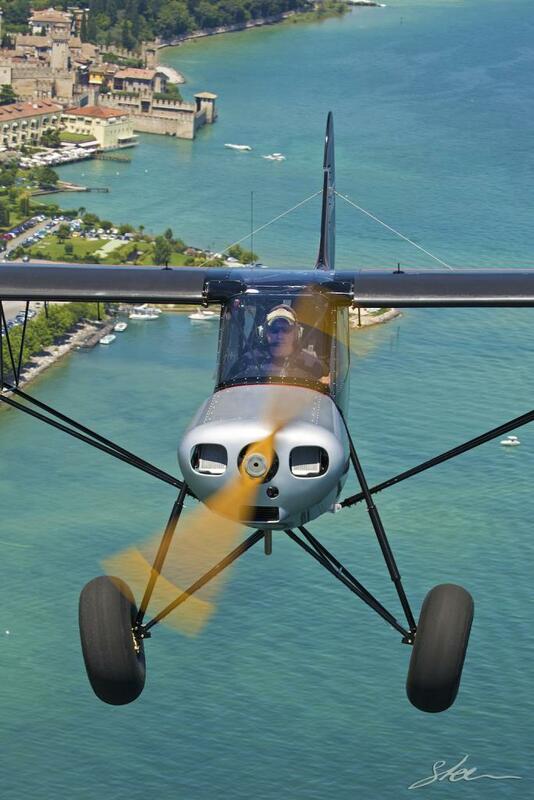 Its contour allows the Ailerons to keep their efficiency to extremely low speed. It’s also under study an innovative Spoiler System to improve the roll control below 40 km/h speed. The innovative new “Double Slotted” Flaps, with a surface 70% larger than the baseline, can be equipped, on request, with our in house developed mini vortex installed inside the vane. 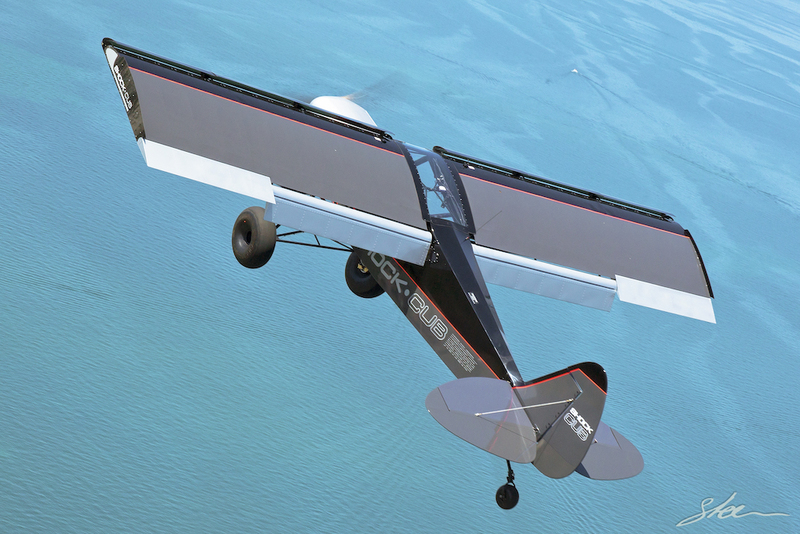 The new Wing, equipped with the innovative Double Slotted Flaps, has made possible to increase tremendously the Lift Coefficient providing excellent performance in landing. The pitching Moment generated by the New Flaps allows the Pilot to “see” exactly the landing area, as the nose will be lower than usual, with the final positive consequence of an improved safety for this kind of flying. The Ailerons surface as been increased by 40% to allow the Pilot to keep full control authority at extremely low speed at the approach / stall. The Wing Braces sections have been beefed up where necessary and the weight increase, including all the structural improvements, is limited to 7 kg per wing. The Fuel Tanks capacity has been increased to 110 liter (on request). The new Wing, can be equipped with extra light Carbonfiber Slats with a total weight increase of less than 5 kg (optional). This device has been extensively developed and tested in Alaska with the aim of minimizing the Cruise Speed reduction (-3 mph) and, at the same time, through pivoting according to the airflow, slowing down the Airplane to unbelievably low speed. 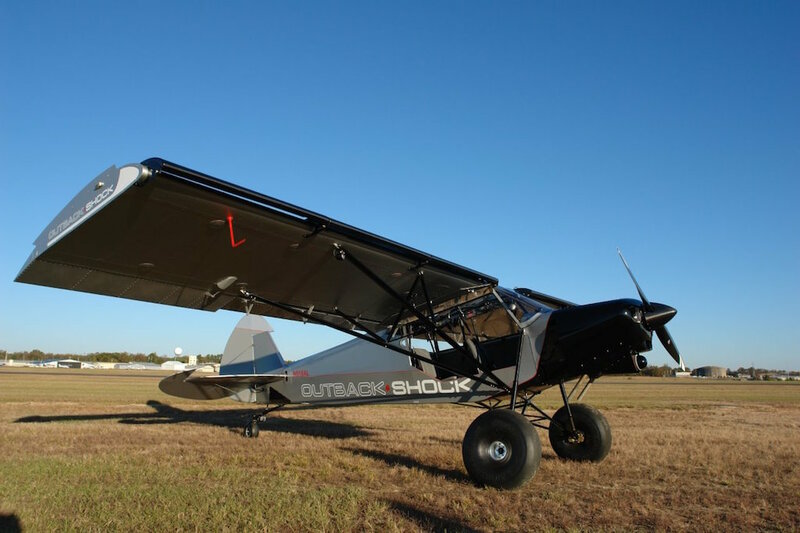 Being fixed and not extendable with spring mechanism, there is not risk of having an half Wing with Slats extended and an half Wing with Slats retracted at the approach, in turbulence, during turning or sideslip, or near the ground. 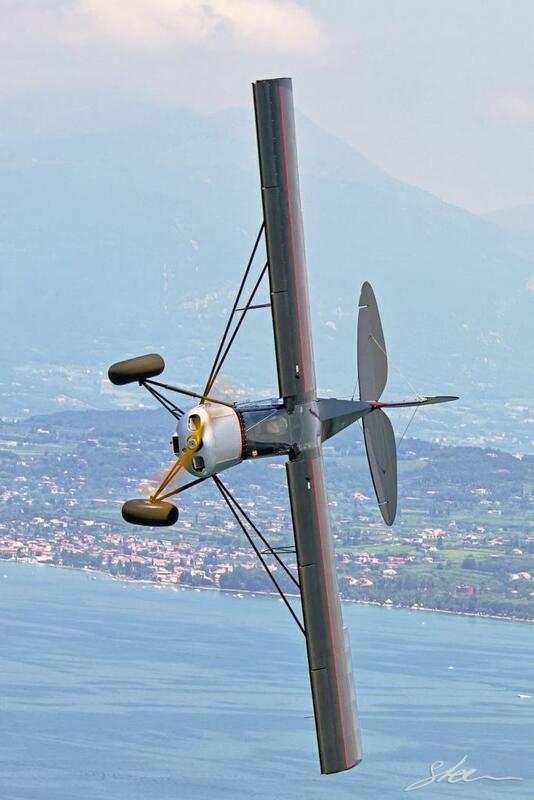 With the Slats a different type of landing can be performed, with the nose very high on the horizon, ridiculous approach speed and contact with the ground with the tail wheel first . This type of landing, defined by us as “competition”, allows spectacular and ultra short stopping spaces, since the Pilot, adequately trained, can contact the ground with pre-activated brakes, thanks to the new forward position of the Main Landing Gear which will avoid any tendency to the overturning. The braking action will also by amplified by the Main Landing Gear damping System which, dissipating the energy due to the high vertical deceleration, will subtract longitudinal kinematic energy to the Airplane and reduce to a minimum the necessary landing distance. With just a relatively small head wind it will be possible to have virtually vertical landings which make the Airplane even safer in its natural habitat. Finally is very important , in the Bushflying and in this kind of landing, the general visibility. This is why the Pilots tandem configuration is believed by the professionals to be the one really valid in extreme conditions and it is not difficult to get an understanding of the reason. The new Slats make spin, in practice, almost impossible, while make easy to control and less dangerous stall. 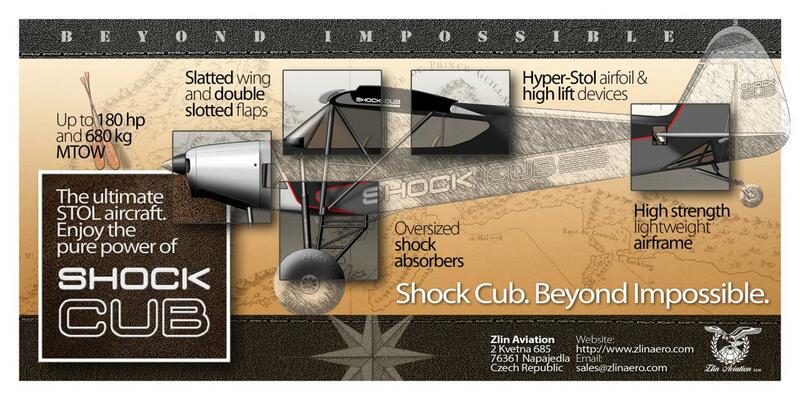 In fact the Shock Cub stall is so unnatural and its stall angle of attack is so high that would never be reached by chance or by error at the approach. All this becomes an additional safety for the Pilot. From this standpoint, in fact, if to an aerodynamic profile “spin proof” are added a structurally improved Wing, a Fuselage structure more robust, an iper-energy absorbing Landing gear and well sized Bush Wheels, besides of really small landing spaces, the Pilot will benefit of a favorable situation in all the most critical phases of flight, namely approach and landing, independently from the kind of flight, standard or extreme Bush Flying, or from his ability. Finally, in the remote instance of a descent with the optional ballistic parachute, the impact will be less problematic because of the Airplane damping system, a factor that should not to be undervalued. 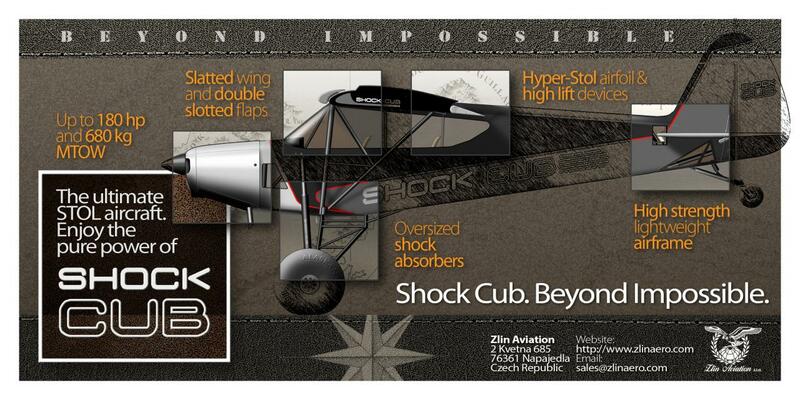 Our new Shock Cub offer this and much more. We could have illustrated it helping your fantasy visualizing operative situations full of emotions but we choose to leave to each one of you the freedom of imagining, after this reading, the infinite possibilities that this new Zlin Aviation Airplane will offer you and not to take away from you the taste of imagining these innumerable, but never the same, scenarios following your preferences and wishes. 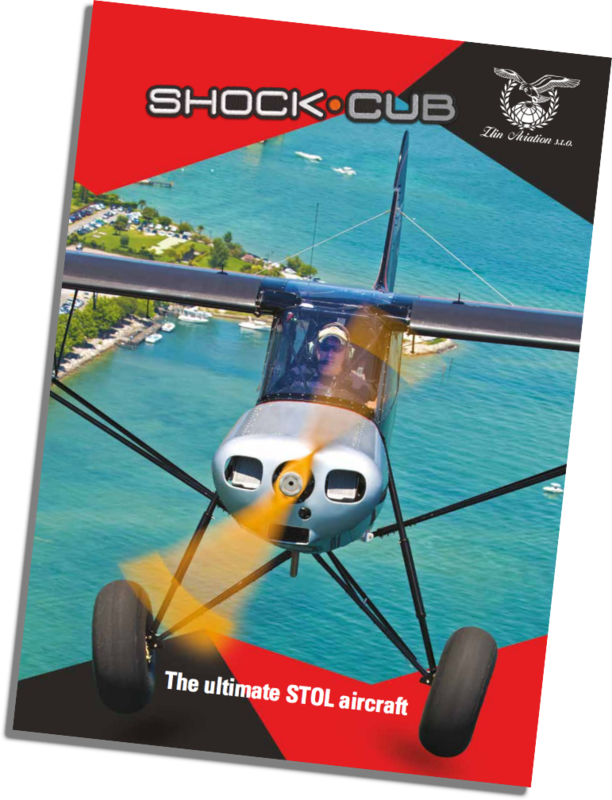 Shock Cub represents for sure, to conclude, a new way in the world of the “Ultra Slow” but not forgetting the possibility of enjoying a respectable Cruise Speed when is needed for moving from “a dream to the next one” in your Flight Plan. All fine, in fact, “Who cares about speed? 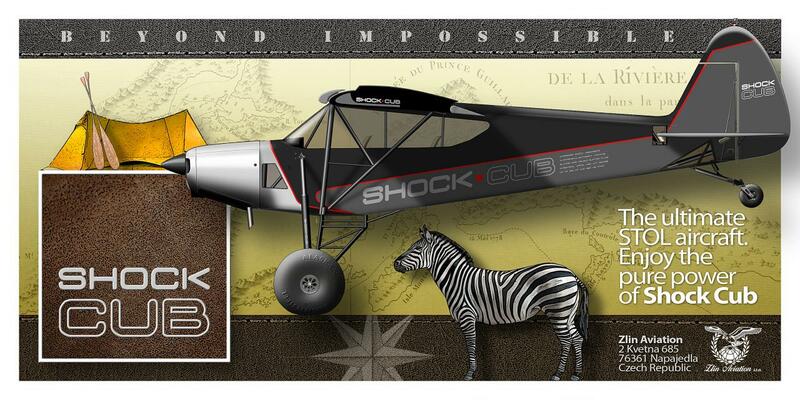 Nothing is like a Shock Cub!”.